Tasting tannic young claret and assessing its future can be a tough job, but at a tasting of the most recently-bottled 2016 Bordeaux, winemerchants and sommeliers were all in agreement that the wines were an absolute pleasure to sample even at this stage. 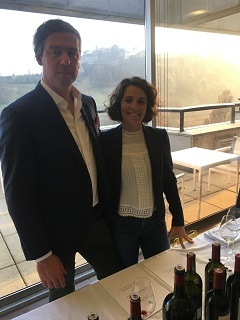 “It was a perfect vintage”, said Edouard Moueix (pictured right), whose family owns Chateaux Petrus, Trotanoy and La Fleur Petrus in Pomerol and Belair-Monange in St Emilion. “The wines are all aromatic and complex with wonderful fruit concentration, acid balance and reasonable alcohol at 13%. What is most impressive about 2016 is how consistent this vintage is across the board in Bordeaux. In a great year like this, vintages tend to erase terroir, whilst in tricky years terroirs will take over”, says Moueix. This is great news for claret lovers at every budget. An even consistency of quality means great wines at every level - from top classed growth chateaux in prestigious appellations of Pauillac, Margaux and St Julien over £100 per bottle - down to the smallest petit chateaux in little-known areas like Cotes de Castillon, Cotes de Francs or Premieres Cotes de Bordeaux at under £10. What also struck me was their readiness to drink. 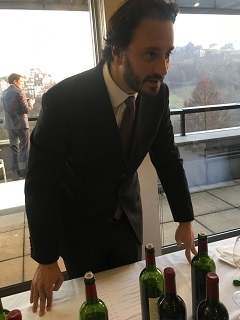 Some 2016s need at least 10 years to start their drinking peak like my favourite classed growths at the tasting: Chateau Pichon Lalande (Pauillac), Chateau Brane Cantenac (Margaux), Chateau Calon Segur (St Estephe) and Chateau La Fleur Petrus (Pomerol). But some of the Cru Bourgeois like Chateau Cissac (Haut Medoc) and humbler Bordeaux Superieur like Chateau Grand Village that I tasted were approachable and almost ready to drink right now. So why is 2016 vintage so perfect? “The winter of 2015/2016 was very warm, but the spring cool and wet. From the end of May onwards into June, July and August it was hot and dry, but the vines still had water reserves to cope and the fruit had set well – and this good weather carried on until September and October harvest. It was one of the driest periods on record”, says Julie Guinaudeau of Chateau Lafleur. What resulted was, as her husband Baptiste Guinaudeau commented: “Wines with pure fine tannins with beautiful texture and depth of fruit”. Comparing 2016 to previous claret vintages, it is definitely the best since 2010. Perhaps best described as a ‘dialled-down 2010’, but 2016s clearly have the potential to age. 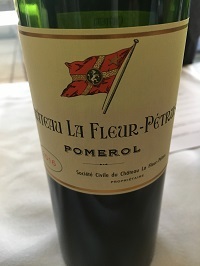 2016 is better in my opinion than 2015, which did not have overall consistency although attractive in some appellations like Margaux and Pomerol. As 2016s start coming into their own, the 2015s will be starting to decline. So what is great news about the excellent 2016 Bordeaux vintage is that you can get remarkable quality even at lower prices under £20 per bottle – so there is no need to buy wines up the quality scale to get a deliciously ripe concentrated claret. Aromatic cherry fruits, sweet generous palate in this 85% Merlot/15% Cabernet Franc blend which is drinkable now, but shows good ageing potential. Lovely ripe impressive claret with good texture, rich blackcurrant fruit and firm tannins – it needs 3 or 4 years longer in bottle to really impress. Good value at this price too. The outstanding wine of the tasting under £20, this fabulous 80% Merlot/20% Cabernet Franc blend is made by Denis Durantou of Chateau L’Eglise Clinet. So open, lush, forward with herby undertones – leave it a couple of years to get even better. Another of Denis Durantou’s Merlot-dominant clarets, this is beautifully made with minerally undertones and fine tannins – but it needs another four years to show its best. More closed on the nose, but lovely texture and herby undertones in this 90% Merlot/10% Cabernet Franc blend. Pop it in your cellar and it will be even better with another three years in bottle. This comes from Chateau Brane Cantenac’s sandier flatter vineyards with more Merlot than in the Grand Vin. A deliciously herbal damson claret with refined silky tannins – approachable now, but will keep another ten years in bottle. Chateau Calon Segur was another star performer at the tasting. Their second wine is the perfect ‘blue jeans’ claret. Very impressive and approachable with its soft rounded structure from 55% Merlot/45% Cabernet Sauvignon blend which will open further with another two years in bottle. 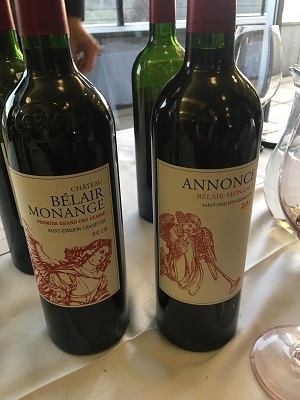 Chateau Belair-Monange is the new merge between two chateaux, Belair and Magdelaine, revitalized by the Moueix family (Monange is the family’s maiden name). This 95% Merlot/5% Cabernet Franc from St Emilion’s limestone plateau has lush generous fruits offering a hint of luxury with its wonderful aromas and lush generous fruits. Rich plummy fruits, layers of cassis, velvet smooth structure, dark chocolate notes; seriously stunning. Made from 70 year old vines planted by Edouard Moueix’s grandfather on three predominantly gravel areas. This 91% Merlot/9% Cabernet Franc blend was the star bottle at the tasting – and one of the best of the vintage. It will reach its drinking peak from 2025 onwards.